Two superb comedians are here with top class work-in-progresses. Sarah Kendall is an award-winning comedian and writer whose stand-up shows have been nominated for Perrier and Time Out Comedy Awards. Her writing credits include Beehive (Channel 4) and Comedy Cuts (ITV) *both of which she also performed in. She is a regular cast member of *Clare in the Community and has made numerous appearances on television and Radio 4, including Russell Howard’s Good News, Best Behaviour, The Now Show, and Dilemma. She regularly performs at major International Festivals including The Edinburgh Fringe and The Melbourne International Comedy Festival. 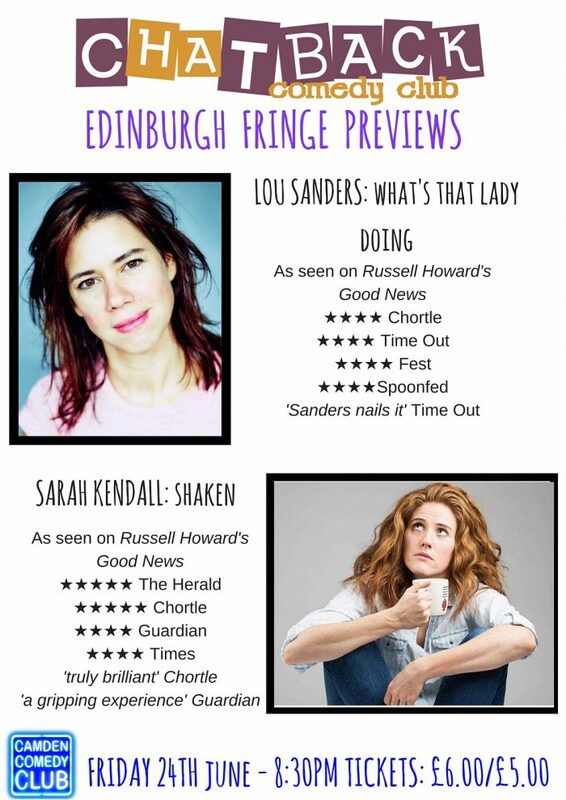 The excellent and always unpredictable Lou Sanders (As seen on BBC3’s ‘Russell Howard’s Good News’)has a host of achievements under her belt as an excellent MC, comedy writer and stand-up. Here she presents her newest work-in-progress.